Mussels are related to other mollusks like clams and oysters. Image: Patty Gillis. Mussels upstream, and mussels down. In between, a four-mile-long “dead zone” where few are able to survive. 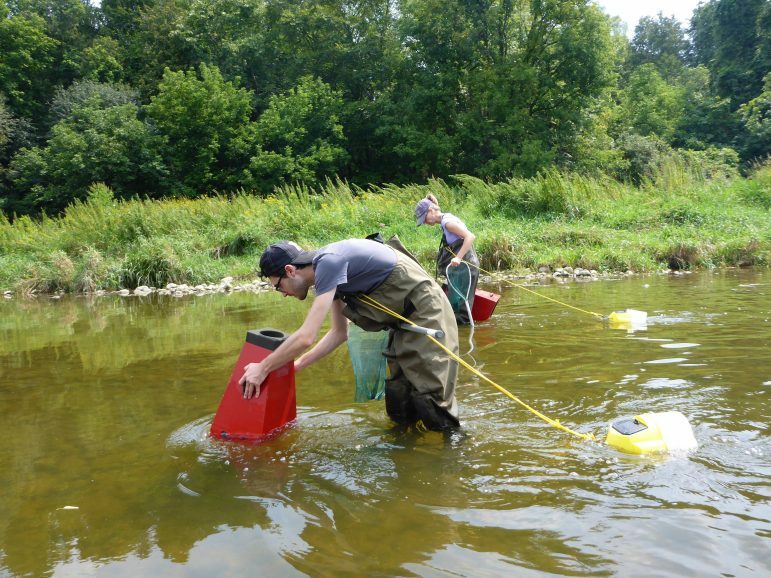 That’s what researchers found in the Grand River, a major waterway running through multiple Ontario municipalities on its way south to Lake Erie. 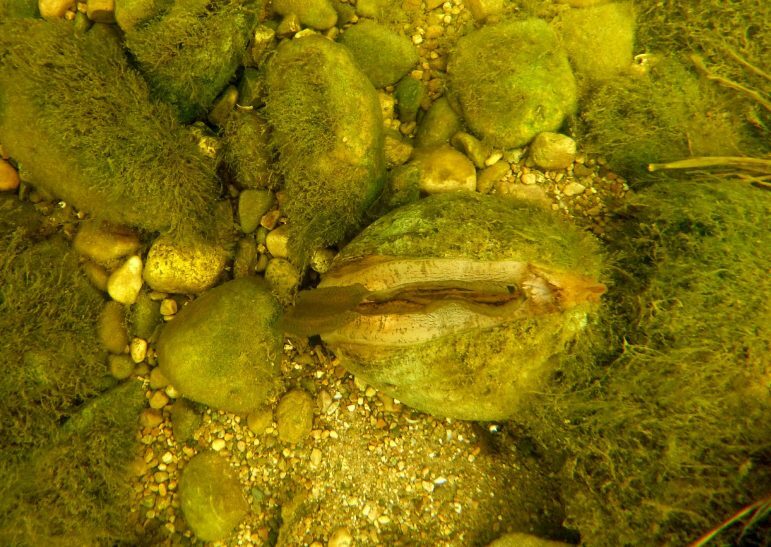 It’s no news that freshwater mussels are hurt by pollutants in urban rivers, but the effects are worse than scientists thought. Freshwater mussels are a type of mollusk–similar to oysters, clams and their saltwater counterparts. They solidify riverbeds, siphon bacteria and algae from the water as they feed and act as a food source for many species. They’ve also been in decline for years. Patricia Gillis, an aquatic contaminants researcher at the National Water Research Institute in Burlington, Ontario, led the team that found the stretch of mussel-less riverbed. “When it took us weeks and weeks to find one live mussel, that was surprising,” Gillis said. The uninhabitable zone begins as the river passes the Kitchener, Ontario, wastewater treatment plant, Gillis said. Researchers found zero mussels in that stretch when they first surveyed it in 2012 and only a few in 2014. They found a healthy mussel population just upstream of the plant, including two species designated at risk by the Canadian government. Their efforts resulted in a study published in the Science of the Total Environment and another in Environmental Pollution. The research team uses what Gillis likened to an elongated snorkeling mask to search for mussels in the Grand River. Image: Patty Gillis. The stretch of river running through the nearby towns of Cambridge, Waterloo and Kitchener has high levels of nutrients like phosphorous, ammonia and nitrates, and contaminants like metals, chloride and pharmaceuticals, according to one of the studies. The area near the Kitchener plant showed especially high levels of ammonia and low levels of dissolved oxygen. Mussels can’t respirate with low levels of oxygen in the water and can die when exposed to high ammonia, Gillis said. 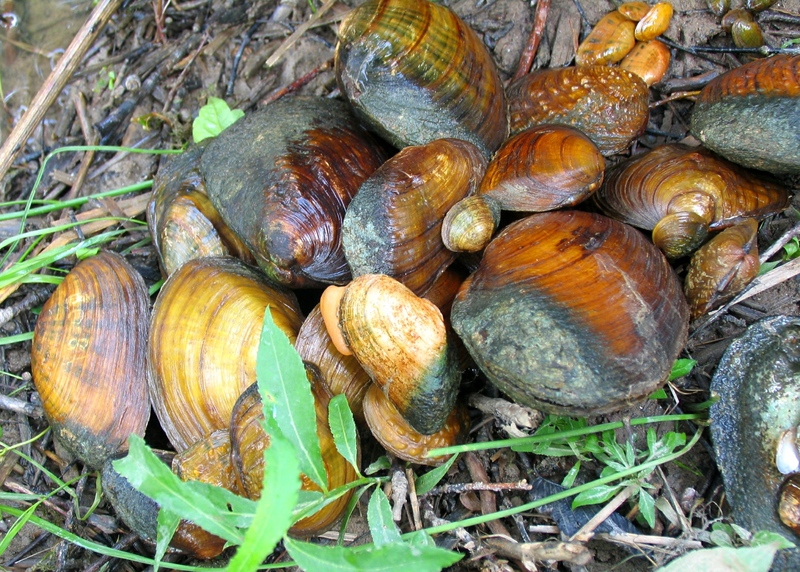 More than two-thirds of the 42 freshwater clam species in Ontario are either threatened or endangered, Gillis said. She called them “the most imperiled group of animals worldwide.” Poor water quality, invasive zebra mussels (a distant relative more closely related to clams), river diversion and harvesting have each taken large tolls. Ammonia levels near the treatment plant did not exceed standards set by the Canadian government, but they do come close to those set by the Environmental Protection Agency in the United States, according to the study. Those standards were lowered in 2013 in response to new evidence that some mussels–especially young ones–are more sensitive to ammonia than was thought. That explains why the few found in the four-mile stretch were each at least four years old. Mussels can close their shells to protect themselves from contaminants, Gillis said, but eventually have to open up again to feed on algae. And their resistance to contaminants varies widely by species. The goal is to find practical steps to protect the mussels, but proving that ammonia is indeed the culprit here is difficult, Gillis said. There are a huge number of contaminants and nutrients dumped into the river from golf courses, roads and wastewater treatment plants. Enough that she “would need a few lifetimes” to test them all. The Kitchener treatment plant, which was particularly outdated, has been upgraded since Gillis found the dead zone, said Mark Servos, who serves as the Canada research chair in water quality protection at the University of Waterloo. Renovations are ongoing, but the water chemistry improved immediately and there are already signs of improvement in the fish populations, Gillis said. That’s good news for the mussels, which use fish to recolonize. Mussels can extend “lures” outside of their shells. These parts of their tissue look like small fish–they even have dots that look like eyes–and draw in predators. Mussels spray their larvae onto the fish they attract, lodging them in the gills. The young mussels travel with the fish and fall off as they grow. This is how the mussels recolonized the Grand River four miles past the treatment plant, Gillis said. That population lives near the mouth of the Speed River, a tributary with better water quality and a larger mussel population. It’s not a rock or a fish – a mussel with its lure extended. Image: Patty Gillis. Even though the fish are improving, it will take time to see how the mussels are affected, Servos said. It will take four or five years until they can go back to look for young mussels. “They’re very long-lived animals with a very low reproductive output,” Servos said. One of the questions to be answered, Gillis said, is whether poor water quality is killing the mussels outright, or affecting the fish enough to prevent mussel reproduction. Servos said that the improved water quality in the Grand River after the upgrades to the Kitchener plant make a good case for improving water infrastructure.